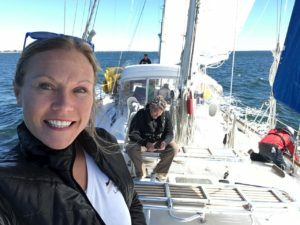 Welcome to episode 62 of The Shooting The Breeze Sailing Podcast featuring returning guest Annie Dike. She has had a very busy year in 2016, starting with a full refit of “Plaintiffs Rest” a Niagra 35, hopping on board a “Fast Cat” on a transatlantic voyage, heading to Isla Mujares aboard S/V Libra, and culminating with a trip to Cuba. This year is shaping up to be just as busy with scheduled activities aboard Libra heading to the Miami Boat Show in February, where Annie will be presenting a seminar and hosting a Ladies Cruise on the way home. You can find Annie and all of her video’s and blog posts at Have Wind Will Travel. You can find S/V Libra at www.saillibra.com. You Can Find Teddy J at the Sail Loot Podcast.